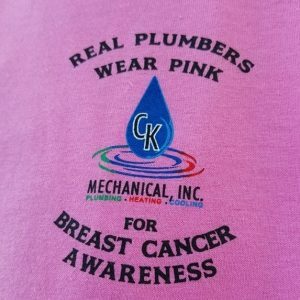 All this month, CK Mechanical will be making a $20 donation for every service call. You can also make a donation and be entered into a LIVE Facebook giveaway at the end of the month. Make sure to support this local company. 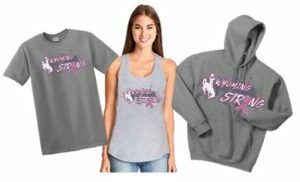 Laramie Screen Printing is graciously donating proceeds from all Wyoming Strong gear this month. 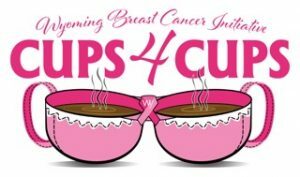 Support a Wyoming company and Wyoming breast health programs at the same time. Purchase a tank, t-shirt, or sweatshirt here or at the store front in Laramie. Cowboy State Brewing is hosting "Drink a Beer, Save a Cowgirl" for the month of October. 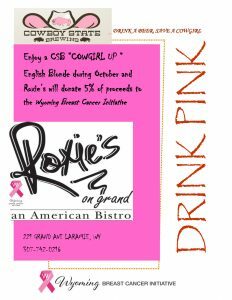 Purchase a Cowgirl Up English Blonde and 5% will be donated back to WBCI. Check out all the locations across the state to purchase a Cowgirl Up English Blonde (CSB Locations). Own a restaurant, bar or retail store? 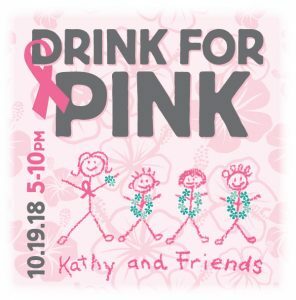 Check out the way to get involved (DrinkPink Retail Flyer). Stop by the Rib & Chop House in Cheyenne, Gillette, Laramie, or Sheridan and purchase a rack of ribs. 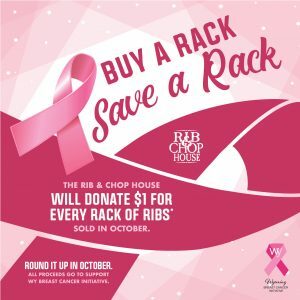 The Rib & Chop House are graciously donating $1 for every rack of ribs purchased this month. You can also give a donation when getting your tab. 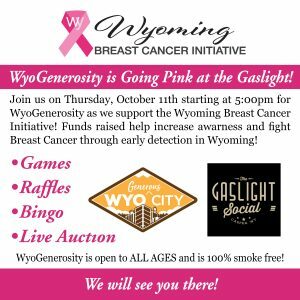 Join us on Thursday, October 11th starting at 5:00 pm for WyoGenerosity at the Gaslight Social in Casper! There will be games, raffles, bingo, and a live auction to benefit the WBCI. This is a family friendly event! Michelle Shimmin, a Tupperware consultant, has graciously added the WBCI as a donation recipient this month for breast cancer awareness. 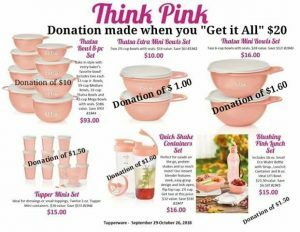 Order some pink Tupperware this month and select WBCI as the donation recipient. Make your purchase here and grab some get gifts. Jordan Anderson, an Usborne Books and More Independent Consultant, has selected the WBCI to support this month for breast cancer awareness. Consider supporting by purchasing Cards for a Cause. 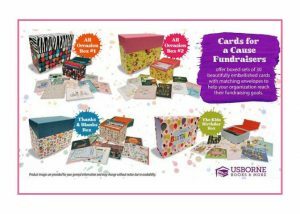 Check out this flyer (Cards for a Cause) for more details and options to purchase and order your cards here. 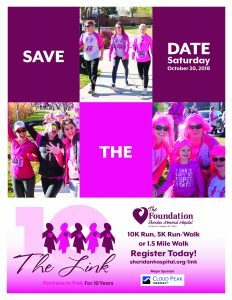 Enjoy a 10k run, 5k run/walk, or 1.5 mile walk on Saturday, October 20th in Sheridan. The run will start at the Whitney Commons at 326 W. Alger. 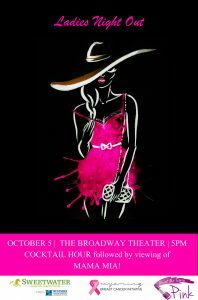 Proceeds go to early cancer detection & screening for patients at Sheridan Memorial Hospital. Check out the 2018 registration form for more details. 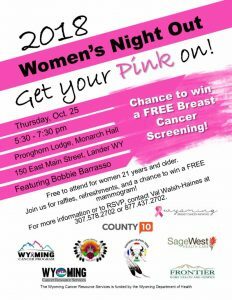 Head over to the Pronghorn Lodge in Monarch Hall on Thursday, October 25th from 5:30-7:30 pm for a Women's Night Out. 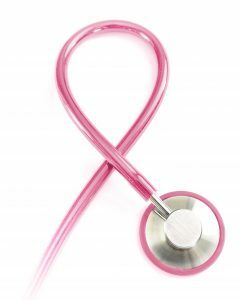 Get your pink on and enjoy raffles, refreshments, and a chance to win a FREE mammogram. Grab your friends and make it a night! "Saving the Rack" together with Paradise Pool Leagues. 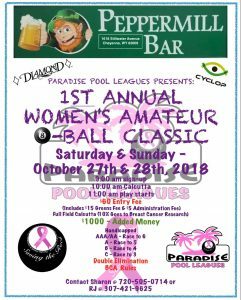 Join them for the 1st annual Women's Amateur 8-Ball Classic on October 27th & 28th. 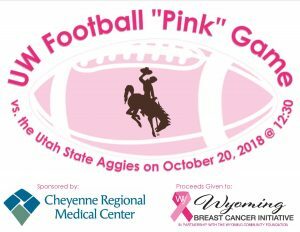 10% of proceeds will go towards breast health programs in Wyoming. Join the LCCC Golden Eagles Women's Volleyball this Friday as they take on Northwest College at 7:00 pm. There will be silent auction items and proceeds will be donated to WBCI. See you Friday night! 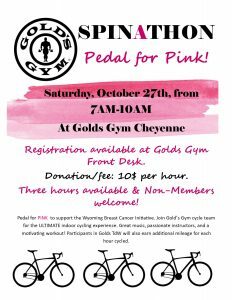 Pedal for PINK to support the Wyoming Breast Cancer Initiative! Join the Gold’s Gym Cycle Team for the ultimate indoor cycling experience! Great music, passionate instructors and a motivating work-out will get your heart pumping and leave you feeling energized! $10/hour will reserve your bike. You will be able to select your time slot at the front desk at Gold's Gym in Cheyenne. Every Tuesday night in October, stop by O'Dwyers Public House for Bingo starting at 7:00 pm. They are graciously donating proceeds from each night to the WBCI. Grab some friends and enjoy a game of Bingo at O'Dwyers (1622 Grand Ave, Laramie). 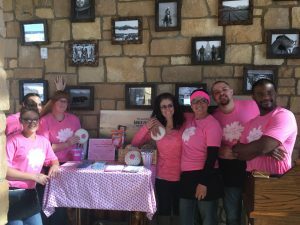 Want to host your own paint Wyoming Pink event?